On Friday, July 27th, a consolidated trial will commence in the two actions known as Concerned Citizens of Dickinson County vs Dickinson County (as referenced above), regarding the rezoning of a proposed development called – East Lock Estates. The proposed housing development is in County jurisdiction just East of Stake Out Road and adjoins the City of Okoboji on the west and south. It is just north of Carlstrom Beach. In September the County Board of Adjustment denied the rezoning sought by the developers. During the Christmas holidays a renewed application by the developers was approved by the Planning and Zoning Commission, Board of Supervisors, and the Board of Adjustment. In September, and again in December, the P&Z, BOS, and BOA each held three hour contentious Public Hearings. The 66 acre parcel was rezoned from Agricultural to R-3 Multi-Family Residential and a Planned Unit Development (PUD). The basic issue at trial is whether Dickinson County properly zoned and approved the development. Important issues in the lawsuits are sewer capacity, water capacity, and traffic density. At the hearings concern was voiced over traffic backups on Highway 71 through Arnolds Park and Okoboji. 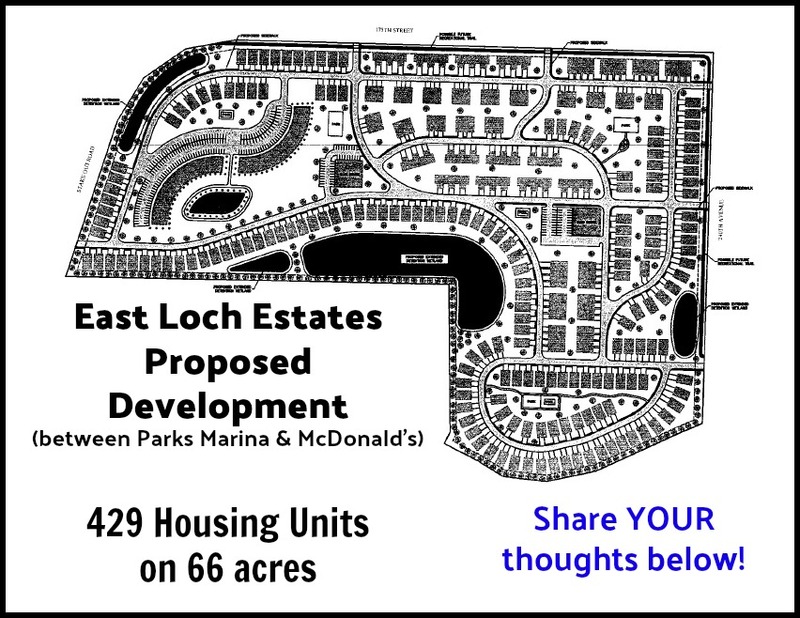 Vehicular traffic from and to East Loch Estates will flow to Highway 71 at Stake Out and Stable Road (175th Street). The developer’s proposal is to build 429 housing units on the 66 acre parcel. Figuring two persons per household this would be an equivalent housing density for the resident population of the City of Okoboji (820) to be housed on the old Inn golf course. The trial will start at 10 AM and is expected to follow court hours thereafter. It will take place in one of the courtrooms on the second floor of the Dickinson County Courthouse.